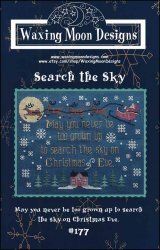 Search The Sky [H5773] - $7.00 : Yarn Tree, Your wholesale source for cross stitch supplies. Cross stitch pattern from Waxing Moon Designs. Remember as a child when you used to run outside the night before Christmas & "Search the Sky" to see if you could see Santa & his reindeer?!?! This "Search the Sky," design, definitely brings back those memories. The snow is falling over the warm cottage. Santa & his reindeer are flaying overheard. "May you never be too grown up to search the sky on Christmas Eve." Stitch count 147w x 108h.